During a week the former president will visit the states of Espírito Santo and Rio de Janeiro. 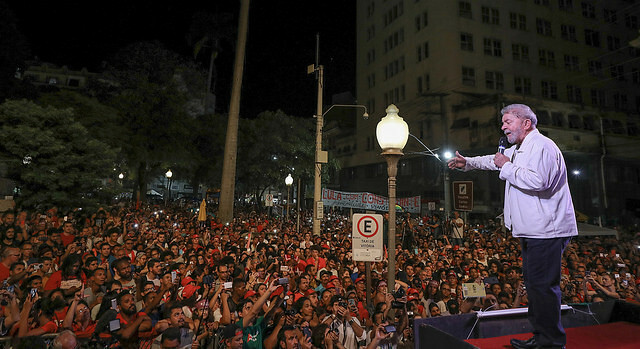 Former president Luiz Inacio Lula da Silva launched the third leg of his national bus tour on Monday in efforts to identify the needs and struggles of his supporters. "The current government is destroying all of the positive gains that we have achieved in recent years. I am here to show you that is possible for this country to grow again, to regain its self-esteem and its sense of collective happiness,” the former president stated during his speech on the first city visited on this tour, Vitória, the capital of Espírito Santo. The third stage of his caravan tour will take him through the two states of Espírito Santo and Rio de Janeiro. The caravan, which is a political initiative of the Workers Party, was initially launched last August in Northeastern Brazil in efforts to engage in dialogue with the Brazilian population about strategies for the future of the country and the restoration of democracy. “I also have a plan to generate formal employment and a way to provide children from low-income areas access to university education,” former president Lula da Silva stated. In his speech, he promised his supporters that he would participate as an eligible candidate in the 2018 presidential elections. He went on to highlight the policies carried out during his administration, which stimulated economic growth in the state of Espírito Santo during his tenure, through investment in the naval industry. The former head of state also emphasized the need for Brazil to regain its position in the international political arena. “We have put an end to our inferiority complex and we must stop being subordinate to the demands of the United States and Europe. We have to look towards building solidarity within Latin America," he said. Under the PT governments, lead by Lula da Silva and Dilma Rousseff, increased its international political influence by providing assistance to the developing countries, particularly through south-south solidarity projects. The vast majority of Brazilian international development cooperation were concentrated in Latin America and Africa. According to the Brazilian Institute of Applied Economic Research, known as IPEA, among the 1,464 projects from 1999-2012 conducted in other developing countries — South-South cooperation — 552 of those, or 37 percent, were carried out in in African nations. The large concentration of Brazilian international development cooperation projects in Africa is a reflection of Brazilian foreign policy priorities, as well as it’s shared identity with the region. Click here for more our real time coverage of the Lula's journey through the state of Espírito Santo and Rio de Janeiro.